Several arrests have been made in New York after protesters shut down Brooklyn Bridge. RT's Aleksey Yaroshevsky reports from the site. Protests are occurring in more than 30 cities in 18 states. Tuesday’s nationwide event was organized by the Stop Mass Incarceration Network. The group is demanding that“the murder of Black and Brown people by the police MUST STOP”; calling for“justice for all the victims of brutal, murdering police”; asking the court system to“indict, convict and send killer cops to jail”because“the whole damn system is guilty as hell”; and to“stop the repression targeting the protests”by dropping all charges against protesters. "On April 14, we're going to revive the spirit of Ferguson, that spirit of refusing to suffer the brutality of the system in silence. And we're going to take it high. We have to get back out into the streets to declare that we're not backing down, we're not going away,” activist Carl Dix told the War is a Crime Organization. 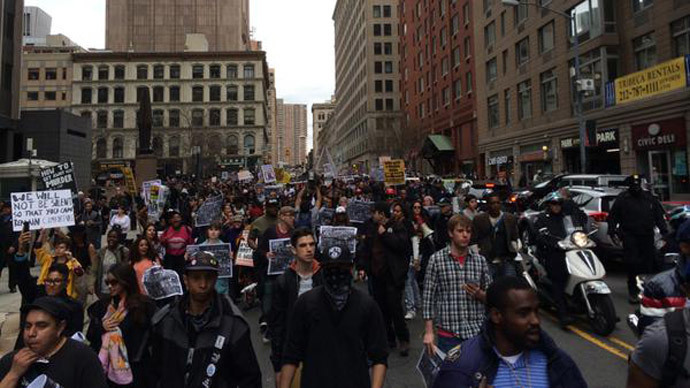 In New York City, hundreds of protesters marched from Union Square south towards City Hall. The demonstrators shut down Broadway, participating in a die-in at the corner of Broadway and Houston, RT’s Alexey Yaroshevsky reported. The group converged on City Hall and the New York Police Department headquarters. “We got a black president, black attorney general, black cabinet secretary of Homeland Security, but we haven’t had one federal prosecution of a policeman for killing all of those folks,” activist Dr. Cornel West told an audience, noting that one African American or Latino has been killed on average every 28 hours. Over 200 people gathered in Chicago’s Daley Center to “disrupt business as usual,” and demonstrators blocked traffic on State Street, according to Chicago Sun Times reporter Maudlyne Ihejirika. In Oakland, California, about 100 protesters gathered in Frank H. Ogawa Plaza. They unfurled a banner that read, “No more stolen lives,” and displayed dozens of photographs of people shot by police, the San Jose Mercury News reported. They then entered City Hall around 2 p.m. local time, blowing whistles. Later in the afternoon, Oakland organizers were “pushing revolutionary communism” and reading Bob Avakian, Scott Morris tweeted. Across the bridge in San Francisco, demonstrators marched down Mission Street towards the police station in the Mission District, especially protesting the death of Amilcar Perez-Lopez, a 21-year-old Guatemalan immigrant who was shot by plain clothes San Francisco Police officers Craig Tiffe and Eric Rebodi on February 26, the Guardsman reported. A simultaneous protest occurred in front of City Hall. Demonstrators then entered the building, despite police attempts to prevent them from getting through security, according to San Francisco Chronicle reporter Vivian Ho. In Southern California, protesters gathered in front of the Los Angeles Police Department.